I was using an SSD previously as a boot/applications drive, this afforded me a bit more space so most of my User folder got moved over there as well. The system was never slow, the previous SSD sitting in the empty optical bay and the HDD bays filled with WD Caviar Black drives striped together for speed. It’s fast vs. impossibly fast at this point. To back up a moment, SSD’s are computing crack. Once you experience one, you will never go back. It’s not even so much the speed as the complete lack of latency that’s addictive — stuff just “pops.” Instantly. I’ve outfitted everything possible with an SSD at this point now that the prices are a bit more reasonable and given space. But you can’t replace your 3TB Green drive with an SSD, so planning is needed. Topic for another day. Performance-wise, here’s what the two PCIe drives are pushing. 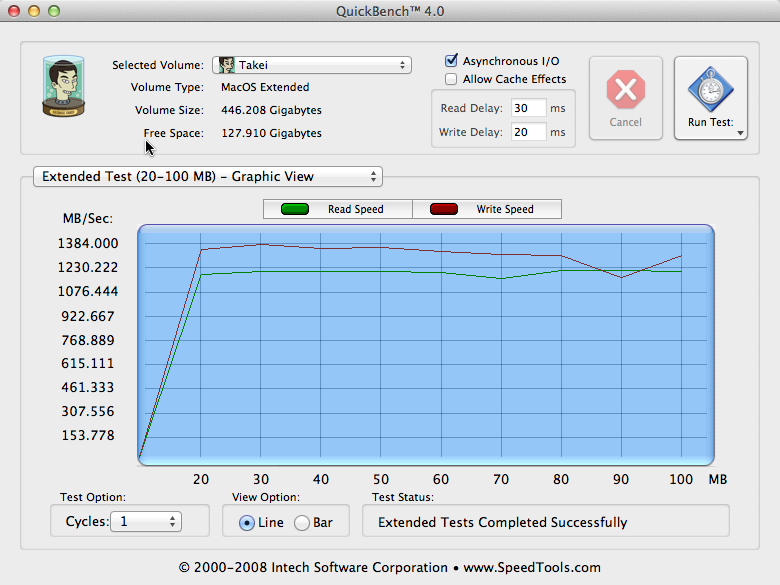 To put that in perspective, that’s about 3x what the previous single SSD was doing. It’s that fast.